I came across these in my Facebook feed the other day. They are similar to the rubber deck tiles in installation but have teak topping. They might be of interest to a brat. @$8.40/sq ft. they are not that much more expensive than the dry deck tiles ($6.29/sq ft at West Marine). I used these on my boat. Not teak, but the look is pretty close. Lots cheaper too. They are beautiful Roger. But, it looks like it would be hard to clean the fish guts and crab trap leavings. 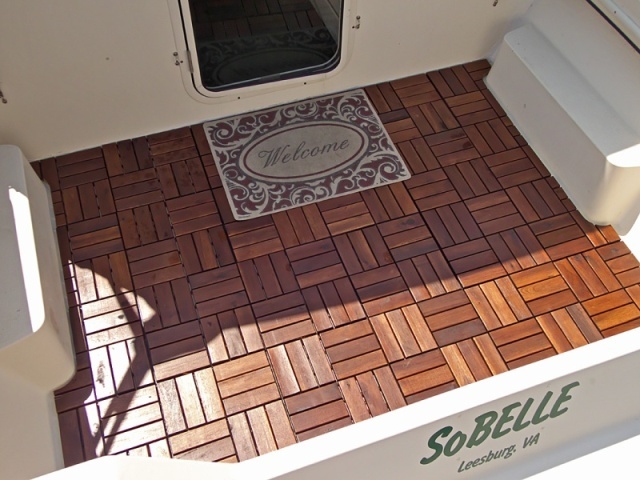 I have owned boats and houses with the short teak decking--glued together not on a rubber backing. (These had a scrim on the back, and were glued to the floor or deck). Both in boats and house decks, eventually these broke loose from the glue. I have no idea how the teak planks are glued to the rubber or plastic backing--but teak is an extremely oily wood, and few glues work really well with it. When we were building boats I did destructive testing because because I was laminating some teak rub rails. I found that the old fashioned Rescorcinal Glue (by Weld Wood) was the best, followed by epoxy. The Dri Deck and similar rubber based tiles are certainly well utilized (and I have them lining the bilge of my current 25). I also came across some harder ones, which do not flex (and may be better for wood overlay)--but they worked well only on flat parts of the boat. ), Reading the reviews--it suggest that the under surface may be a plastic rather an rubber based (?). There is also suggestion that the planks are screwed to the substrate--is that correct? If so--these should be SS fastenings.